There are many perks that come with being a beautyheaven member. Get an overview in the video below and scroll down for everything else you need to know. Sign up to beautyheaven. It's free and will only take you two minutes, we promise! Earn points for doing what you love: Reviewing products, commenting on articles and participating in the forum with like-minded beauties. Swap your points for beauty products in the beautyheaven Rewards Room, exclusive to loyal beautyheaven members. Come back and review the products you get, to earn more points and do it all again! Score a seat on our Trial Team where you'll get sent the latest products to test and give your verdict on. Receive free Discovery Bags with products for you to trial and review on beautyheaven. Apply to become a Platinum Member, meaning you’d be eligible for maximum rewards and perks. NOTE: To ensure beautyheaven remains the best place for truly helpful beauty product reviews, we only accept product reviews that add value and help others. Your review may be positive, negative or even neutral, but you must explain why you think that. Tell us what you liked, what you didn't, if it didn't suit you then who woud it suit? It doesn't need to be an essay, but one sentence probably isn't sufficient. Read more on how to write a good product review here. Members who have reached Silver status or above can swap their points for FREE beauty products in the Rewards Room. The beautyheaven Rewards Room is an online pop-up shop filled with health and beauty products. It opens a few times each year and durin this time, eligible beautyheaven members get to spend their hard-earned points for free beautyproducts (and just pay $10 postage). When the Rewards Room is open, members are notified via email and on beautyheaven. 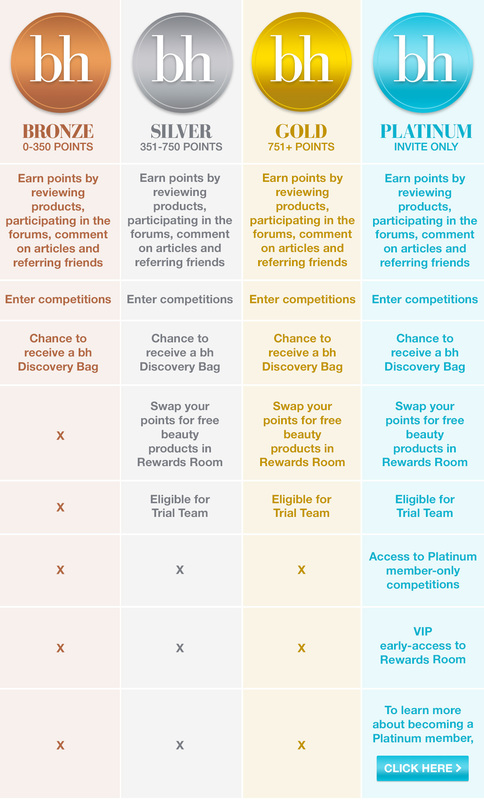 A button appears on the homepage and this is the gateway you click on to enter the Rewards Room, and browse the available products. You can then select the products you want (which you have enough points for), pop them in your cart and check out. At checkout, the points value of your product is deducted from your beautyheaven account, and all you have to do is to pay a small subsidised cost for postage. 10 points = $1. When the points value is not a whole number, it is rounded to the closest number. Eg. 554 points would be rounded to 550, and 609 points to 610. Note: Spending points has no impact on your Membership status. If you’re a Gold member with 800 points, and you spend 750 points, you will remain a Gold member (i.e. you won’t drop back to being a Bronze member as a result of spending your points. Once you reach a status, you stay there). For more information check out the Rewards Room FAQs. What are you waiting for? Join the beautyheaven community now and you’ll be on your way to scoring beauty rewards and free beauty products! Don’t forget you have to have reached Silver status or above to be eligible to take part in the Rewards Room. Beautyheaven membership is absolutely free, but there is a subsidised delivery cost for sending out products redeemed in the Rewards Room.